(RRP £599.99). 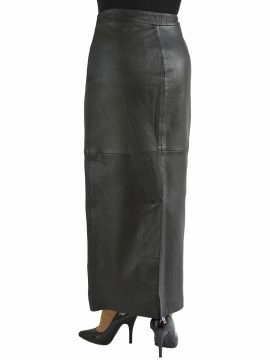 An absolutely stunning retro/vintage-style long black leather midi skirt, a full circular skirt reminiscent of the 1950s, with a striking scarlet red and black lining. Made in high quality soft lambskin nappa, it is exquisitely tailored to flatter the figure. It is a wrap-around with press stud fasteners down the side and has a deep waistband. Leave some of the lower press studs open to show off the lining and your legs! Made by Ashwood for Tout Ensemble. Also available in larger sizes for the fuller figure, up to waist 44in/112cm. 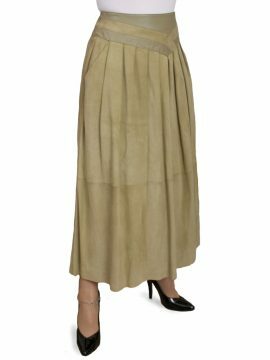 A stunning, luxurious black long leather vintage full skirt – a retro/vintage style full circular skirt in superior fine quality lambskin nappa, reminiscent of the 1950s. Sheer elegance and flattering to the figure, it is a wrap-around with press-stud fasteners on the side and a striking scarlet and black lining. TIP: If you keep the lower press studs open, the skirt will fall open as you move and when you sit to show off the lining and your legs! 2. Select the size from the drop-down box which corresponds to your measurements. Being such a full skirt, the hip measurement is not crucial, but it is important to get your right waist measurement.